It’s that time of the year again! The holidays have already started, and Christmas is only a few days away. And with that will come the yearly tradition of Christmas office parties. You will get to see the fun and festive side of your coworkers, and you will get to socialize with colleagues you don’t usually talk to on a daily basis. Naturally, you want to show up looking your best, and make a good impression. Rest assured! Parties require special care when it comes to making up as opposed to dates or everyday outings. First of all, they usually last longer, especially keeping in mind that you will probably show up a bit early. And they also involve a bigger crowd, and lots of mingling, even a bit of dancing. That’s why you need to be sure your make up stays in place, especially if you have oily skin that repels make up. Thoroughly clean your face beefier applying any make up, then use a primer on your face and eye zone. After finishing your make up, top it off with setting spray to make sure everything stays in place throughout the night. As for your lips, dab a bit of foundation on your lips before applying lipstick, then apply your color of choice in layers, paring with a bit of powder before every new layer. This will help the color hold on to your lips, and survive the part’s snacks and drinks. Nail art gives great room for creativity and creative expression. If there is an artist in you, grab your nail kit and get to work on Christmas themes nails. If you’re not well versed in nail art, don’t worry. You can use nail stamping to create a appropriate season look. If you want something even easter, you can use Christmas and winter-themed nail stickers. Reds, greens, whites and silver, and gold are all good colors to be included in your Christmas party nail design. As mentioned above, starting with clean, relaxed skin is the best way to make your make up look its best. No matter how good your make up is, or whether you follow the best anti-aging tips, if you’re not taking good care of your skin before your event, your final look will suffer. Make sure you follow your skin care regimen consistently in the week following up to your Christmas party and use masks that are suitable for your skin type a day or two before the event. A clay mask is best for those with oily skin, while a moisturizing mask is a way to go for dry skin, and all skin types can benefit from exfoliating. If you are going to use an exfoliation mask, though, so it at least a day in advance to avoid any skin irritation. Red lips are king when it comes to the holidays, but not everybody is comfortable with that look, especially at an office Christmas party where you may feel the need to remain a bit on the conservative side. Or may be red lips are not going to go well with your outfit. If you are wearing a dark outfit, definitely go for red lips. The dark outfit will bring the whole thing together without being over the top. Be sure to choose a lipstick shade that goes well with your skin tone. If, however, you feel that the colors of your outfit clash with red lips, you can choose any warm color that suits your dress. Cinnamon is a good choice, and so is berry and burgundy. Even if glitter is not your thing in day to day life or even special occasion, now is the time to shine. Glitter is a staple at Christmas party make up. Keeping in mind that you are going to an office party, you need to keep your shining glitter beads under check. Choose only one place to apply glitter. It could be your eyes, your eyeshadow, your lips, or a glittering highlighter, but don’t combine several glittering elements in your make up look. An exception here could be nails; you definitely can combine understated glitter nails with glitter lipstick for example. Gold glitter is a very good choice for Christmas, but feel free to use any color that suits your look. While you want to look your best in this yearly event, remember that simplicity carries the beauty of its own. Of course, your make up will be more intense than your daily office look, but you wouldn’t want to show up with an over the top full face of make up, full on with glitter and bright colors. Don’t try to be subtle, but keep your make up within reasonable limits. With the above being said, don’t take things to the other extreme and stay in your make up comfort zone. When it comes to Christmas and the holidays in general, there is no harm in being a little adventurous. After all, you want to have fun and show your holiday spirit. A splash of red or a touch of gold will be more than welcome or may be even a ridiculous Christmas hair accessory if you feel like it. 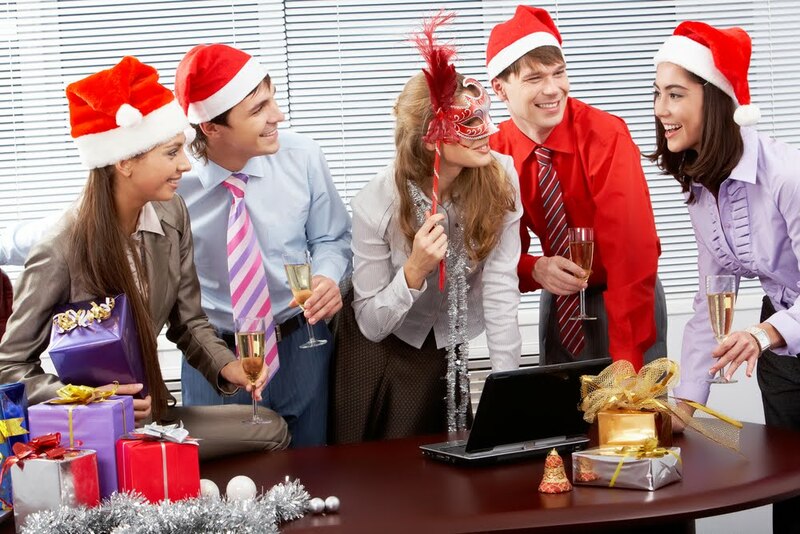 The last tip for your Christmas office party is to have fun and enjoy your time. The above makeup tips are sure to put you in your best look, and it is now up to you to concur your best Christmas spirit and have some jolly time. Kathy Mitchell is a writer and avid researcher on the subject of Health and Beauty. She enjoys sharing her passion about natural beauty with her followers and helps them to live a natural lifestyle at Solvaderm. She likes to go out with her friends, travel, swim and practice yoga. In her free time, you can find Kathy curled up reading her favorite novel, or writing in her journal. To know more about her follow her on Google+, Facebook and Twitter.